Emerging zoonoses are new infections transmissible between humans and animals caused by a wide range of pathogens. It is estimated that 60% of emerging human pathogens are zoonotic of which over 71% are of wildlife origin. Globally, zoonotic diseases are of significance owing to their increased public health threat and the negative impact on animal production, commerce, travel and economies. The importance of zoonotic diseases in rural areas extends beyond the realm of public health. Apart from causing human disease and mortality, they affect the agricultural production and social structures of a community. Zoonotic diseases decrease the availability of food, creating local and international trade barriers. In addition, the more remote the area, the less access there is to public health care and veterinary care. 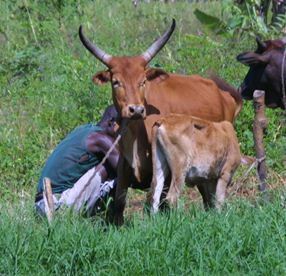 Despite this, many areas with so called emerging agricultural systems are also highly connected to centres of high population density where the markets for agricultural products are – so zoonoses are an issue in both sites of production, and of consumption. The fight against these zoonoses starts by eliminating the pathogen at source and mitigation of the driving factors. These diseases must therefore be addressed through collaborative efforts between animal and public health authorities. Improved surveillance to detect the disease in both human and animal populations coupled with modelling the disease transmission dynamics to predict outbreaks and evaluate control measures is essential in providing security against emerging diseases. These diseases need also be given priority in government ministries of livestock and public health and more research to be undertaken to understand the landscape of pathogens in their natural ecology and other disease determinants. By applying the “One Health” concept is imperative in improving our preparedness against emerging zoonoses. Our group creates a unique inter-disciplinary platform for enhanced dialogue and research on some of these diseases such as: developing a surveillance system for zoonoses in the western part of Kenya (ZELS), MERS-CoV among camel herds in Kenya, disease emergence at the human-wildlife interface in urban settings and investigations on transmission of pathogens in the community and in specific risk groups at the livestock-human interface (PAZ project). A recent parliamentary policy briefing by the UK Society for General Microbiology (view briefing here) has highlighted the significance of, and mitigation measures against, these emerging zoonoses. The Society for General Microbiology is a membership organisation for scientists who work in all areas of microbiology. It is the largest learned microbiological society in Europe with a worldwide membership based in universities, industry, hospitals, research institutes and schools. The Society publishes key academic journals in microbiology and virology, organises international scientific conferences and provides an international forum for communication among microbiologists and supports their professional development.